Summer is the peak season for eggplants, and the perfect time to prepare a roasted eggplant salad. This dish is perfect for a picnic basket to enjoy on a leisurely summer day. The quality of an eggplant can be discerned by its shell. The peel should be shiny and taut — this is how you know that it is fresh. You can estimate how many seeds an eggplant has by its weight: the heavier it is, the more seeds it has. A perfectly elegant dish for springtime is salmon in pastry. It is easy to prepare and a wonderful crowd pleaser. 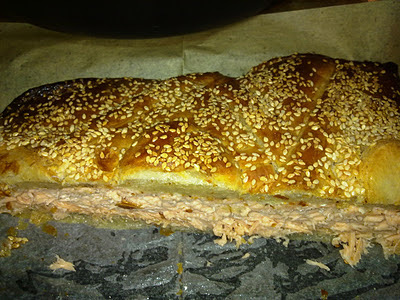 All you need is good quality salmon and frozen puff pastry. I buy the best quality salmon I can find. Salmon does not live in the Mediterranean sea, so I have to buy it frozen. I purchase salmon that has been flash-frozen on the fishing boat. I leave it in the refrigerator overnight to defrost, then I prepare my tasty treat. What chicken recipe should I prepare? My children won’t eat. They need new and different foods every day in order to remain stimulated. I looked around the house and noticed an open bottle of Arak (liquor flavored with anise seed). It inspired me! Here is my idea for a weeknight chicken dinner. There are so many types of breaded chicken! For a new twist on an old standby, here is a recipe for oven baked chicken with falafel flavored breading. Instead of corn flakes, we crumble Bissli, the ubiquitous Israeli snack food, to make the breading. Every time I go shopping I am tempted to buy cauliflower. For some reason, I have a lot of sympathy for cauliflower. It is not as popular as peppers, tomatoes, cucumbers, or eggplants.